In the next couple minutes, I’m going to walk you through one of the most effective natural processes that I know of on the planet, to grow bigger healthier plants and vegetables, faster than you ever have before. More importantly it’s a process which is 100% organic, entirely natural, and can be used to complement traditional composting methods and take your green finger to that next level. It’s a process which you can easily incorporate into your gardening regime with just a few minutes per week and it’s extremely low cost (in fact you’ll actually end up saving money on fertilizer in the long run). A natural process that has been happening on the planet since time began, but for whatever reason, almost every gardener out there seems to completely overlook. Perhaps that’s because it might seem more convenient to run down to the local gardening store to purchase chemical fertilizer and pesticides. When in truth, you can be making much more effective, totally natural fertilizer from the comfort of your own home – in less time than it takes to actually drive down to the shop in the first place. You’ll see just how easy that is in a moment. A study conducted by the University of Georgia’s Engineering Outreach Program found that tomato plants grown entirely in worm castings grew on average 3 times better than identical plants grown in standard potting mix, and nearly 4 times better than those grown in standard soil. Each was planted in the same volume of growing medium, was given the same volume of water and sunlight exposure every day, and the experiment was carried out in a climate controlled room. Yes, these plants are exactly the same age. If you want to grow bigger healthier plants and vegetables, faster than ever before, it’s time to seriously start looking at worm composting (the technical term of which we call vermiculutre). So what exactly are worm castings? Organic waste matter goes into your worm farm. This can be your left over kitchen waste. It can also be organic material you’re already removing from your garden. Although there are some things you’ll want to avoid. In short time the organic waste matter becomes covered with billions of microbes & bacteria. These microbes eat away at it breaking it down. This is the natural process of decaying organic matter. The specific composting worm species we use (we don’t use regular earthworms) eat these microbes, taking in all the beneficial nutrients and replacing them in the worm farming eco-system as worm poop (or worm castings). You continue to add more organic waste to the top of your worm farm, and as the microbes below are consumed, the worms migrate up towards the newer material and microbes on the top. This leaves behind pure worm poop in your lower level. You can then harvest the pure “worm castings” from the lower worm farm level for a continual supply. If you want to, you’ll be able to plant directly into the worm castings themselves. You’ve already seen the photo that shows how effective this can be. In fact worm castings act exactly like a slow release fertilizer – one that’s totally PHP balanced as nature intended, so there’s no danger of root or fertilizer burn. 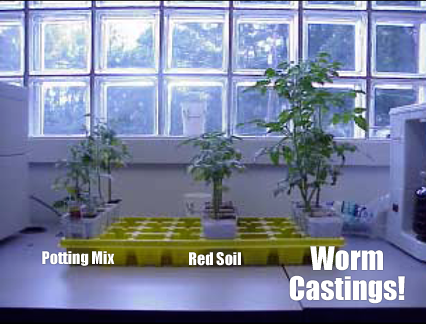 However, unless you’ve caught the worm composting bug and really scale up (chances are you might when you experience the results) you’re more likely to just add a proportion of the castings to potting mix or other growing mediums. This will give them a powerful long lasting boost of nutrients for continuous good plant health. For example, compost worked in with soil as you usually would, but then also using worm castings scattered under (or around) your individual plant root systems works amazing well. This will also make things go much further – i.e. you can introduce them into your entire gardening ecosystem for maximum impact. You can also use them for your indoor house plants too. If your worm composting system supports it, you can also use what we refer to as “worm leachate”. This is the liquid that drains out the bottom of the worm farm into a collection tray. You can feed this to your vegetables and plants as a liquid fertilizer as it contains a tremendous amount of beneficial microbes, good bacteria and essential plant nutrients. The general rule of thumb is to dilute 1 part worm lecahate with 4 parts of water to make it go further and spread the love. If you want something even better than the lechate you can also brew “worm tea” – this can be many times more beneficial and go even further. In fact, many organic farmers brew this in huge volumes and use it to fertilize their entire plots. It also helps with pest suppression & disease control, as well as enhancing plant growth too, which is really cool. Worm tea is a bit different from lechate. It’s made by “brewing” some of your worm castings in a volume of water with a few additional ingredients to help “activate” the tea. Those additives are natural food sources for the microbes which they then feed upon and multiple into the billions – i.e. the activation process. This dramatically increases the number of beneficial microbes contained within the tea and makes it extremely powerful stuff. You can use worm tea as a liquid fertilizer, but as previously mentioned, you can also spray this directly onto plant leaves and foliage to act as a totally organic and natural pest & disease repellent It’s amazingly effective on aphids and many other smaller insects and undesirable organisms that can setup shop in your garden. You know – a standard old fashioned composting bin or compost heap? Well you can’t really compare the two because they’re two entirely different things. That’s because when we worm compost, we focus our efforts with pin point accuracy to create and be able to utilize the worm by products (worm castings, lechate, and tea) directly. We also use very specific species of worms (generally Red Worms or Tiger worms) because they’re much more efficient. Not only that but they actually behave very differently from ordinary earthworms. Whereas earthworms burrow into different layers of the soil (that’s why you generally do find a few worms coming up through the ground into a standard composting setup), Red Worms actually spend most of their time just under the leaf litter and decaying organic matter. This gives us the ability to be able to separate the worm by products much more efficiently. As we add more organic material to the worm composting system, the worms continue to move up to the new material, leaving behind their poop. We then just continue with this natural process and end up with a continuous supply of pure worm castings. So there is a difference between standard composting and composting with worms – the two techniques complement each other rather than compete. A standard composting bin just ISN’T going to provide you with your own organic, natural slow release fertilizer, nor will it provide you with the powerful liquid fertilizers a worm composting system produces. That’s why (if you’re even lucky enough to find them in stock in the first place) pure worm casting sold at your local garden center can cost as much as 10-20 times the price of standard compost for the exact same volume! If you really want to take your green finger to that next level – and impress your neighbors and friends with a tremendously lush and healthy garden – then it’s time you seriously looked at worm composting. 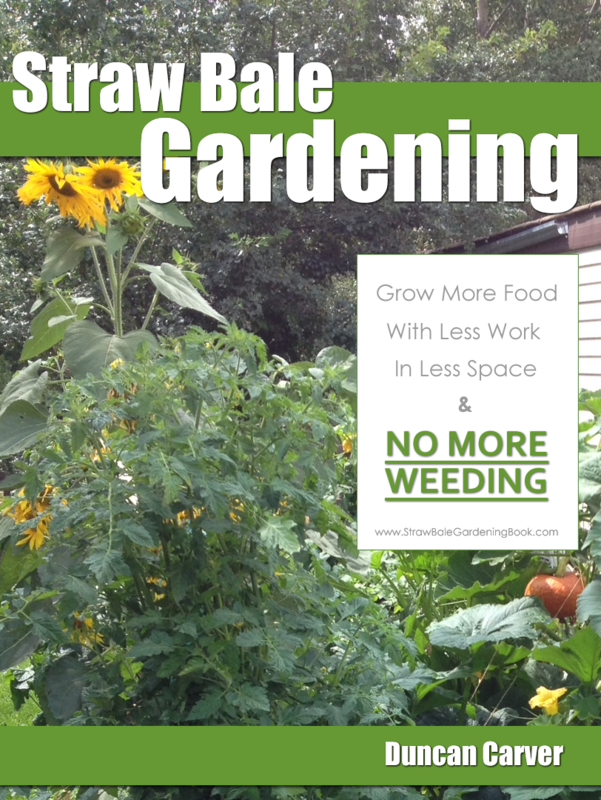 You will notice a massive difference in the growth rate, health, and overall well being of your garden. If you’re interested in learning more about worm composting, in a step-by-step guide to help you get started – than grab a copy of our book now. 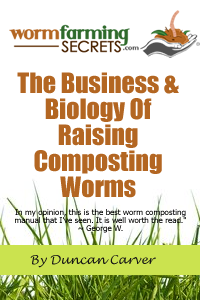 It’s called “The Business & Biology Of Raising Composting Worms” and is available for immediate download in our private members area. It’s a PDF document so you’ll be able to download it to your computer in just a couple of minutes and get stuck into reading it right now or over the weekend. Save a lot of money on fertilizer – you’ll be making your own! Dramatically increase the growth rate and health of your plants. That’s right. You can download and evaluate the book right now for just $3. That also comes with full access to our private members area where you’ll find a lot of other useful resources too – including access to our worm composting discussion forum. Check it out for the next 7 days. If you think its great then just do nothing. You’ll then be charged $17 per day, for two final payments – bringing the total cost of the book & membership to the original price of just $37. Alternatively, if after evaluating “The Business & Biology Of Raising Composting Worms” (and members area) you feel that it’s not going to help you grow and maintain a spectacular garden and ultimately save you more money, just cancel your payment plan within the next 7 days and you won’t be charged again. You’ll be able to download the book immediately after payment has been made and you’ve registered for the members area (a 30 second process). The book & other resources can be viewed on either a PC or MAC – and we’ll provide you with full instructions if you need help.